Spring is the time of the year when the sun is warm and everything is turning green after a long winter. It’s when plants are tender and springing into life, flowers blooming and birds chirping. Making your lawn look pretty is essential to match the mood. Here are some tips to improving your spring yard. 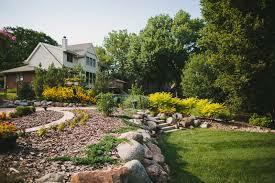 You should avoid heavy work on the yard until the soil is completely dry. Then, you can rake your lawn, remove fallen debris and dried leaves this will give it a good spring cleaning. Doing a lot of work on it while it’s still tender will destroy the delicate shoots of plants trying to grow and make the soil compact from being stepped on while still soggy. If there is still a pile of snow, spread it so it can melt easily. After all the cleaning, you can conduct a soil Ph. test before applying fertilizer. Fertilizing your lawn is an important way to keep weed away, increase the strength of the roots and also, promotes the growth of plants. Using DIY fertilizer helps in keeping your lawn green all year round. Fertilizer should be used in every season, this will help in proving potassium, nitrogen, and phosphorus to the plants. Re-seed bare spots on your lawn. The loose soil should be 2 to 4 inches deep, then you can put the seeds on the bare parts of the lawn and gently pat with the back of a rake to firm them in the soil then water. Watering plants during the spring is very important so the won’t wither. Make a vegetable bed. This could be both healthy and help in cutting down on money spent on groceries. If there is a chicken in the surrounding environment, you could build a raised bed for the vegetables to prevent them from being eaten. Adding a netting or wiring around it will be helpful to prevent pests like birds too. Make sure the bed is positioned where it can get sufficient sunlight during the day at least 6 hours. Install drip irrigation in your flower beds or vegetable garden. Plants need a lot of water especially during spring because the cold air dries them easily. Using a hose to water plants is sometimes not good especially for drought-tolerant plants, it could drown them. Also, it helps in reducing water wastage. Apply mulch around the roots of the plants. The layer could be 2-3 inches. Mulch is important to the growth of plants since it helps in keeping a medium temperature, retaining moisture, prevents weeds from growing, and increases soil micro-organisms important to plants. It could also help enhance the physical appearance of your garden. There are different types of mulch; there is recycled rubber mulch, compost, leaves and shredded bark. The best mulch in suppressing weed is the rubber mulch. Aeration is important for your lawn. It helps in allowing water, nutrients, and oxygen to reach the roots of plants. Aeration leads to healthier and greener lawn that is more productive. To aerate, one could use soil conditioner products. Sharpen and make sure your equipment is in good shape. This means sharpening your lawn mower blade and other lawn equipment. This helps in making sure you have no problem in taking care of the garden all through summer. Make a neat walkway. You can do this by using crushed granite, bricks, sandstone, limestone and others. These will help enhance the appearance of your lawn. Use different stones in variation with the weather. Pop the color in your yard. You can do this through planting different colored plants in your yard, flowers, and others. Also by painting your chairs, benches and hang colored lanterns among others. This makes your yard more colorful and inviting. Applying this tips to your yard improvement will result to a colorful and healthy looking spring yard.